Can everything served be slightly above mediocre and still give you an enjoyable meal? Clearly, possible as I found out at the Iftar menu at Clarion. 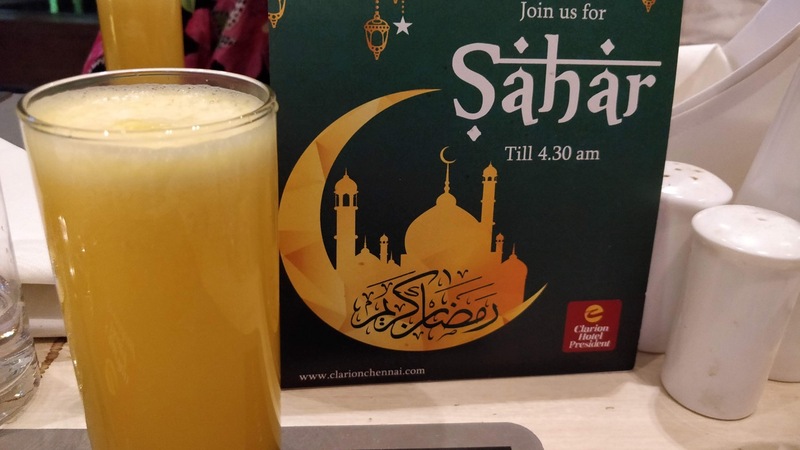 With no advertisements anywhere, I stumbled upon this place while driving and noticing the 'Sahar Available till 4 am' billboard outside the hotel. Surely then, there must be Iftar too, right? Right. We walked and learnt that while Sahar is all a la carte, there is an Iftar priced at Rs. 599 nett. A full glass of orange juice and not some miniature version arriving was a welcome change. A bowl of fruits, layered with must melon and watermelon came next. Yup, nothing great so far. A plate of fried snacks came in. Actually, a set of dips served prior piqued my curiosity. An asian sauce, our very own coconut chutney, a sweet chutney and mint chutney. Then arrived those snacks. 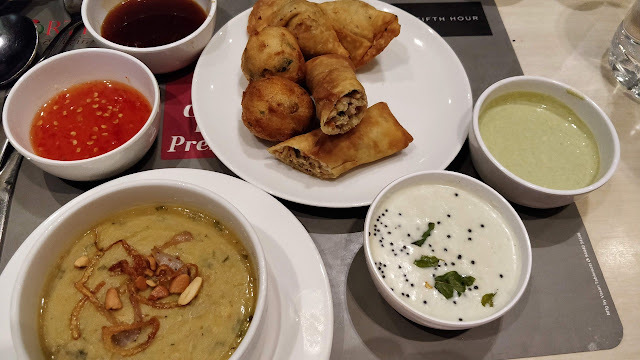 A spring roll sliced to two, for the Asian chutney, two bondas for the coconut chutney and two mini samosas for the sweet and mint chutneys. 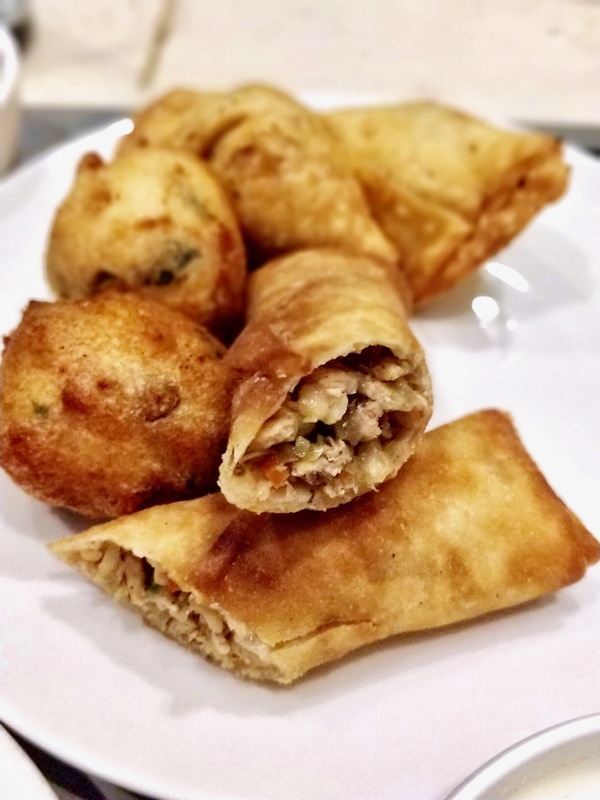 While the spring roll and bondas were nice, the samosas stuffed with minced meat was a drab. Still, so far, so good. 'Haleem sir', he said as he placed the pale looking dish in front of me. The dish, though was screaming something else. The balance of lentils to meat was completely tipped in favour of the former, but while I'm not sure if the chef took this recipe from somewhere or it was his idea of cost cutting, this reminded me of Kichida, a less meaty variant of the haleem served in many parts of the country. 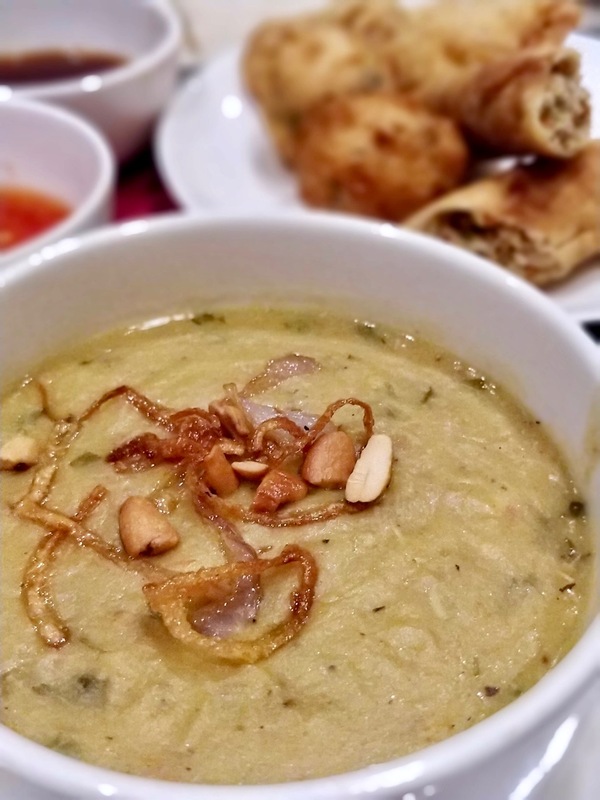 Not haleem-y enough, but enough flavours to satiate the palate. What's in a name, right? Thankfully I wasn't craving haleem, else, this paragraph would have been written differently! 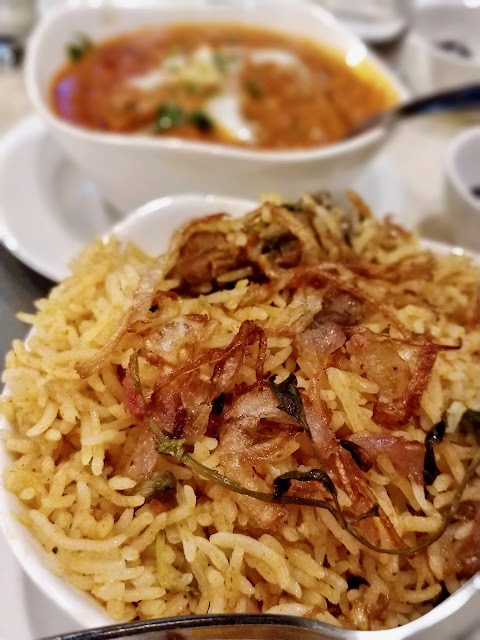 Then arrived Biriyani, a bowl of breads and butter chicken. Here, the portions were more than generous. For a small eater like me, one could serve three, but in reality, it could certainly feed two. 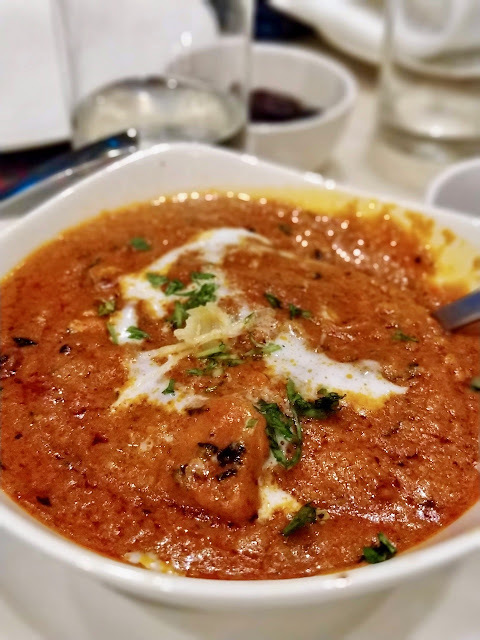 The breads were fresh and well made with copious amounts of butter, but while neither the biriyani nor the butter chicken were winning any awards, they were surprisingly comforting. We packed an entire portion home and it served us for a good two dinners along with our home made idly. And then a plated dessert. Yes, a plated dessert. 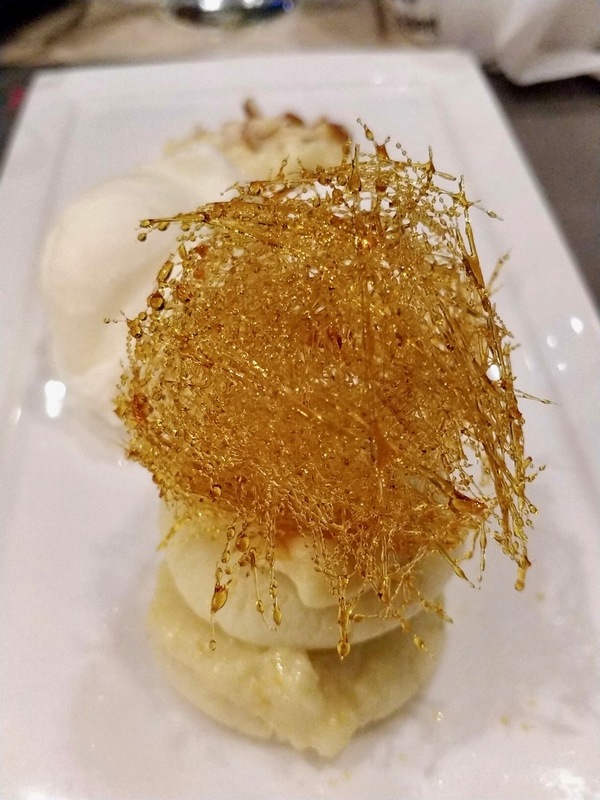 Rasamalai, topped with caramelised sugar strings, with ice cream and some rabdi. Nope, not winning any awards again, but the chef has really tried to impress. 599 is all you pay. No other taxes or service charge extra. The waiter told us that we should try and make it for Sahar (the early morning meal before we start fasting). If they had a package, I certainly would have. Clarion hotels is the erstwhile President Hotel on RK Salai, Mylapore. There was an Asian restaurant called Ming that I had written highly about, but apparently it shut about three years ago. I don't know the name of this restaurant, but for now, it serves an excellent Iftar at a reasonable price.